Just three paragraphs in the Senate’s Regulatory Reform bill could not only weaken the health of North Carolina’s waterways, but also increase the likelihood of devastating floods and mudslides. As written, this portion of Senate Bill 131 could benefit not only the entire development industry, but one of the bill’s primary sponsors, Sen. Andy Wells. A Republican, Wells represents Alexander and Catawba counties. He is the managing partner of Prism Companies, a “full-service” real estate company that includes development, brokerage, property management and investment services in the Hickory area. Prism is selling another 46 acres with the amenity of 800 feet of creek. Wells did not respond to an email seeking comment. NCPW also left a message in-person at his legislative office. It would extend the length of a stream that a developer could harm or destroy before having to mitigate the damage. Currently, that threshold is 150 feet. That means if in the course of building a neighborhood or shopping center, for example, a developer destroys 151 linear feet of stream, the company must pay a fee for the entire length to a mitigation bank. NC Department of Environmental Quality’s Division of Mitigation Services manages that process. Those funds are used to improve water quality or habitats nearby. But under the proposed language, developers could damage 300 feet before paying a mitigation fee. And if the company destroyed 301 feet of stream, it wouldn’t have to pay for the entire length of damage – just the amount over 300 feet. In this case, just 1 foot. 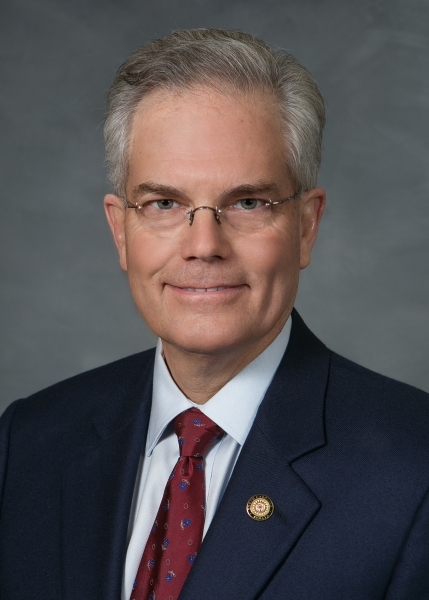 In a Senate Agriculture and Natural Resources committee meeting last week, Wells said the bill language was intended to align North Carolina’s requirements with those of other states and of districts overseen by the US Army Corps of Engineers. But that’s not true. Wells could look no farther than our neighbors, Tennessee and Kentucky, where developers can’t disrupt any length of a stream without mitigating the environmental damage. In Tennessee, there is a separate threshold for streams that cross roads: 200 feet, which would still be shorter than the 300 feet proposed in the Senate bill. Virginia, South Carolina, Alabama and Mississippi do set their thresholds at 300 feet. The US Corps of Army Engineers has to approve the changes, so it’s unclear why the proposal is included in the legislation. “I don’t that language will change anything,” a representative from NC DEQ told the Environmental Management Commission last week. 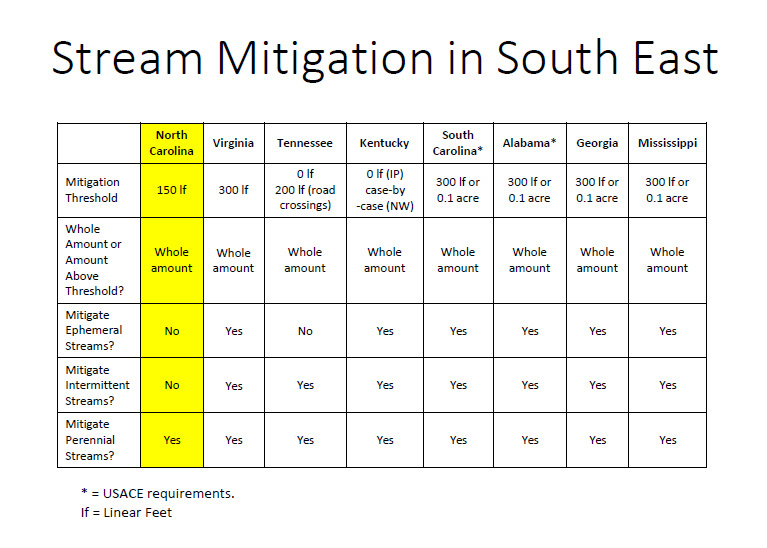 As for Corps of Engineer districts, Savannah, Charleston and in some cases, Mobile, all have stricter mitigation requirements than North Carolina. Louisville and Norfolk require 300 feet. Also tucked in the Senate bill is the weakening of protections for intermittent streams. These streams, which are seasonal, contain water for only part of the year. If North Carolina were to follow the lead of other Southeastern states, it would require developers to mitigate damage to intermittent streams. Virginia, Tennessee, Kentucky, Alabama, Mississippi, Georgia and South Carolina all have that mandate. Instead, the bill shortchanges intermittent streams, to the detriment of people and land downstream. According to the USDA Forest Service, the EPA and the scientific community, intermittent streams control the amount of dirt, water, debris that flows into rivers, lakes and creeks. Since the flow of water is intermittent, these streams can collect sediment and release it gradually rather than in one blast of devastating flooding. Intermittent streams also help create downstream habitats for plants, fish and frogs.